However, the much-coveted kings may not be a welcome sight to fishermen this year. Stephanie Schmidt is the Summer Season Fishery Manager along the Yukon for Alaska’s Department of Fish and Game. She said Chinook numbers continue to be low — mandating fishery closures once the salmon enter each upriver community. Several fishermen voiced frustration at the closures, not because they’ll miss out on the long-restricted kings, but because gear restrictions — such as on nets larger than 4 inch-wide mesh — will hinder their ability to capture the more abundant chum. Jack from Huslia explained that the arrival of Chinook salmon typically coincides with the peak summer chum run in his community. “That’s when the best fish go by for us. That’s when we lose our half-dried fish and our dried fish,” he said. Because Chinook salmon can be caught in gill nets just as easily as chum, all nets wider than 4 inches will be off-limits once the kings arrive. 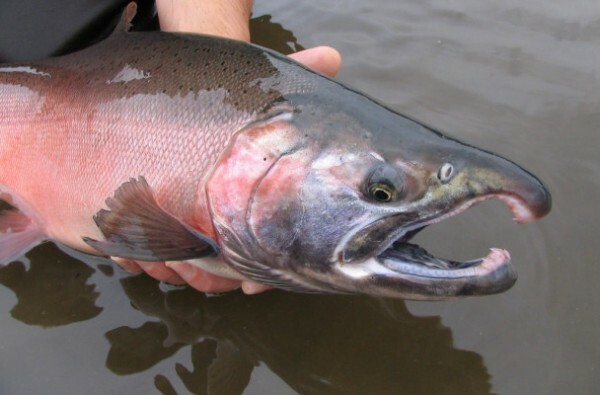 Schmidt said fishermen will still be allowed to use nets that are 4 inches or smaller for sheefish and smaller species throughout the salmon closure. That came as small consolation in communities where purchasing other, smaller nets may be cost prohibitive. Schmidt thanked fisherman for their continued efforts to conserve king salmon — and said she knows it hasn’t come without sacrifice. She also shared some positive news from ADF&G researchers monitoring Chinook in Pilot Station. The meeting concluded with an atypical concern: Fishermen wanted to know what would happen to state-managed fisheries on the Yukon, and further North, if Alaska’s legislature is unable to reach an agreement on the state budget before July 1 — instigating a partial government shutdown. John Linderman is regional supervisor for the Arctic Yukon-Kuskokwim region of commercial fisheries. He believes it’s unlikely that lawmakers will allow the budget impasse to reach that stage. However, he said wildlife managers have considered it, and there is currently enough money to keep fisheries functional until August 2015.